Addressed for Success. Primed for Personalized Printing. Print providers look for efficient devices to move jobs effortlessly from production to finishing. In the direct mail space, digital print technologies and finishing features like cutting, slitting, and trimming are necessary to offer customers personalized features with fast turnarounds. Established in 1976, Handy Mailing Service started with six employees in a 4,000-square foot work area in Wichita, KS. The company originally provided typed addressing, hand inserting, and hand affix PS address labels to Wichita and surrounding counties. After adding digital printing services nearly 15 years ago, Handy Mailing Service is now a full-service digital and offset print shop that offers complete automated bindery and mailing services alongside print capabilities. The shop estimates that 75 percent of its work is now outside of KS. The company has 15 employees that operate out of a 10,000-square foot facility. Handy Mailing Service offers direct mail services to a variety of industries including dentists, marketers, non-profit organizations, and the oil industry. “A high percent of our business is for marketing companies and much of it includes variable data digital printing,” says Virgil Esau, owner, Handy Mailing Service. He says recent advancements in media and print technology affect digital direct mail and the amount of mail that comes off digital presses has increased, featuring jobs that are personalized in multiple places, addressed, and ready to trim and tray for the post office. The print and mail services provider utilizes Konica Minolta presses—specifically the Konica Minolta bizhub 8000 and C1100 color printers. For B&W applications, the print provider uses the Konica Minolta bizhub 1200. The shop also employs a Colordyne 1600 Series full-color envelope and sheet printer, which is powered by Memjet technology. “When we started we had no idea who to go with. To make the decision we went to three different vendor offices and ran about 500 11×17-inch sheets over each different file,” explains Esau. After comparing production times for each file run, the company quickly realized the advertised speeds were different from production throughput. After completing a blind test, Handy Mailing Service found that 100 percent of the best quality picks were from Konica Minolta. “Konica Minolta had the best production speed and in our case, the best cost value,” he says. Handy Mailing Service automatically inserts on three Phillipsburg inserters for highly personal mailings. “Many of our customers require hand inserting of personalized and lumpy mail,” explains Esau. The company’s digital finishing equipment lineup also includes MBO equipment and Kirk Rudy tabbers for tabbing, live stamping, affixing Post-it notes, and scratch off labels. “We quickly found that finishing was something we could do faster offline,” says Esau. Handy Mailing Service recently updated its cutter from a 20-inch Challenge 205 to a 30-inch Challenge 305 from Colter & Peterson when it realized the needed to cut larger and more sheets at a time. The Challenge 305 cuts 26 cuts per minute with a 30.5 inch cutting width. It uses programmable electronic clamp pressure control per cut to reduce and eliminate clamp mark waste. It purchased the cutter with an air-fed side table for heavy paper loads requiring trimming. The air-fed side table includes a built-in blower that provides a cushion of air that floats the lift of the paper. Esau says the new paper cutter is very effective for the company. “It increased our speed and accuracy of cutting plus eliminated work backup,” he adds. Handy Mailing Service recently completed a direct mail job to promote its business. The job included promotional inserts inside white envelopes with a black hard font and teaser to the left of the mailing address. The direct mail was addressed to customers and included promotional specialized offers. “Direct mail is our business so using it to illustrate success to our customers is important,” says Esau. The company designed the art in Adobe Illustrator and printed with PrintShop Mail. PrintShop Mail is a standalone variable data printing and composition tool. Esau says the company chose this software because it is designed to handle direct mail projects. It personalizes promotional communications with barcodes, layouts, graphics, and text based on customer information from databases. The envelopes were printed on the Colordyne 1600 Series S while the inserts were printed on the Konica Minolta bizhub PRESS C1100. The C1100 prints 100 pages per minute in color and features 1,200 dpi with eight-bit processes for color images. The C1100 handles paper sizes up to 13×19.2 inches and weight up to 350 gsm. The promotional pieces were trimmed with the 305 Challenge paper cutter and stamped with a Kirk Rudy tabber and stamper. Once the company obtained final approval of the art piece, the project was immediately ready to print. Handy Mailing Service completed 800 direct mail promotional pieces. It was satisfied with its promotional offer and distributed the directly mailing to customers. 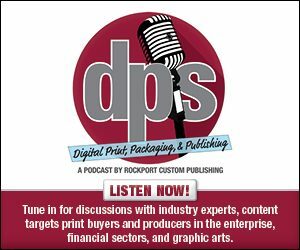 Digital print allows print providers to offer customers personalized direct mail. Handy Mailing Service uses Konica Minolta presses and Challenge finishing devices to produce envelopes and postcards at quality levels with fast turnarounds.